Reviews for the best natural & organic cosmetic, food, and baby products. Women all over the world have been painting their nails with beautiful and exotic colors for decades. However, these nail polishes are very harmful to your body. There are some very toxic chemicals contained in typical nail polish that can be easily absorbed into your body and cause some health issues. These same chemicals can also stain your nails causing them to look old and unsightly. This is not exactly what we are going for when we choose nail polish. 1. What Is Organic Nail Polish? These chemicals also make your nails weak and brittle. Some nails tend to bend and break very easily when using traditional nail polish. However, in recent years there has been a revolution in the nail industry–a solution to the harmfulness of nail polish. It is called organic nail polish. This type of polish was created to grant you the ability to wear whatever color you like all while keeping yourself healthy and clear of harmful and toxic substances. We have put together a list of what we think are the 10 best organic nail polish brands out there. Organic nail polish is a nail lacquer or polish that is applied to fingernails and toenails. It is made without many of the harsh chemicals and substances that are found in most other types of traditional nail polish. Organic nail polish covers your nails with a beautiful color that is designed to keep them healthier. Most other nail polishes contain many substances and chemicals that make your nails weak, brittle and stained over time. These chemicals can also be absorbed by your skin to cause illnesses or allergic reactions. With organic nail polish, some of these unhealthy substances have been removed and replaced so that you get beautiful color and character without putting yourself at risk. These nail polishes work by providing you with a beautiful way to cover your nails and still be healthy. Some organic nail polish even helps to improve your nails by adding vitamins and minerals to keep them healthy and strong. You can find many different brands of organic nail polish online through websites like Amazon and eBay. They can also be found online through the manufacturers themselves and popular beauty stores like Ulta Beauty. Some of these polishes are available for purchase in big box stores that have a beauty department, such as Walmart and Target. However, their selection is typically limited when it comes to organic nail polish. All of the organic nail polish listed here fall between $9 and $20. The list of organic nail polish below was reviewed based on the following parameters: Features, Pros & Cons, Price, Where to Buy and Warranty. The organic nail polishes on this list fall between $9 and $20. Some brands tend to be more expensive than others for many reasons such as popularity, who they are endorsed by, and the cost to make them. Some higher priced brands on this list are known to produce high-end beauty products and therefore can charge more for their products. It seems, though, that there are organic nail polishes that are pretty equal in comparison to those that are lower in price and even offer some better benefits. ZOYA NAIL POLISH ~ TONI ZP627 ~ NEW DESIGNER COLLECTION FALL 2012 !!! Zoya is one of the first brands to begin to offer a non-toxic option for nail polish. They have a "ten free" formula which makes them the most chemical-free brand on our list. They are also known to provide polish that is smooth and consistent throughout. It lasts a long time and makes nails even stronger and more resilient to chipping with their top coat options. Zoya has over 300 different colors and shades to choose from, with new colors emerging on the market every season. This product can be found in stores and online for around $. There is no warranty information available for most nail polish, organic nail polish included. Hard to remove with a special non-toxic nail polish remover, as is common with most of these organic nail polishes. DEBORAH LIPPMANN Nail Polish, Grey Day, 0.5 fl. oz. Item Condition: 100% authentic, new and unused. Deborah Lippmann Gel Lab Pro Grey Day (Limited Edition). This brand of organic nail polish is designed with beauty and the environment in mind. The formula used is that of a gel, so you get a polish that is thick and long-lasting. This makes for a smoother finish that is even and lacks any streaking. It also makes the polish harder to chip; and therefore it stays on your nails for longer. However, this product is the most expensive on our list. Tenoverten was created by two friends for their nail salons in New York. What is unique about their polish is their "eight-free" formula that strives to keep harmful substances away from your body and provide you with a much healthier option for your nails. They offer a wide range of colors, but it's their pastels and creams that steal the show. essie nail polish, petal pushers, 0.46 fl. oz. America's nail salon expert. since 1981. Essie is a well-loved and very well-known brand of nail polish. They can be found in just about any beauty department regardless of the neighborhood. However, they have evolved even more, as of recent, to include a new line that eliminates three of the most harsh and toxic chemicals typically found in nail polish. And of course, they are continually coming out with new colors of every shade and style to compliment every season. 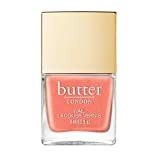 butter LONDON Glazen Nail Lacquer, Blaze, 0.2 oz. For this organic nail polish, butter LONDON has paired up with PANTONE to bring you an "eight-free" nail polish formula that is healthy and looks great. In fact, it looks good enough to be named 2018's color of the year. The polish has included a variety to it to make harmless to your nails and good for them too. This polish will help keep your nails strong and healthy. However, it is important to note that most of the bottles available on the market are found in "fashion" size. This is a very small size more like a travel size of nail polish bottle, making it not very affordable. This product can be found in stores and online for around $. This is for their smaller "fashion" sized bottle. It is more like a travel sized bottle than the regular sized ones. JINsoon has created a "five-free" formula to make nail polish healthier and more environmentally friendly for all. Their polish is known for its high-quality color, a long shelf life, and a long average wear on your nails. This make-up brand was created in 2004 to design cosmetics and beauty products that combine effectiveness, healthiness, and beauty. 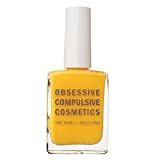 So it is not surprising that they have concocted a vegan-friendly, PETA approved, and cruelty-free option for nail polish lovers. They also boast many high-definition choices for those that like bright and bold colors. However, many reviews note that the color that comes out of the bottle is not always close to the color that appears just by looking at the bottle or picture online. High Shine.Smooth Coverage.Long Wear.NOTE: This product is NOT damaged and rather the dings on the top are a stylized part of the cap design. Smith and Cult is known for their high-end nail polish and "eight-free" formula, making it a highly organic option. Most other brands can only boast a 3, 5 or 7-free formula. They also offer a wide variety of colors and extras, like sparkled top coats, which make it easy to find a color that is perfect for you and your style. NON-TOXIC WATER-BASED FORMULA - 100% Chemical Free & eco-friendly. 5 Free, 7 Free, Vegan & animal cruelty free, All Free. NO Formaldehyde, NO Toluene, NO DiButyl Phthalate (DBP), NO Formaldehyde resin, NO Bisphenol A, NO ethyl acetate and acetone or Camphor. ODORLESS - Natural ingredients make Piggy Paint nail polish virtually odorless compared to solvent-based alternatives. KID-FRIENDLY, SAFE FOR PREGNANCY - Made in the USA, you can rest assured that all of the natural ingredients are safe for pregnant & nursing moms, for use on babies, toddlers and young children. FULL SIZE BOTTLES - At .5oz (15ml), each bottle is equal in size to the traditional nail polish bottles everywhere. Many non-toxic alternatives are half the size. HARD, DURABLE FINISH - For best results use our Basecoat/Sealer and Topcoat (sold separately). Use a blow dryer on each layer to help ensure scratch and chip resistant results. Piggy Paint was created by moms for use on their children. They wanted to make it safer for themselves, too, if they are pregnant or trying to become pregnant. The "seven-free," water-based formula is completely non-toxic. This makes it entirely safe for kids that frequently have their fingers in their mouths. It is also 100% odorless and hypoallergenic. It's created perfectly for children. However, its water base does make it a little thin, so multiple coats are needed for a good, smooth coverage; the base also allows it to chip fairly easily. Pacifica's "seven-free" formula lacks seven of the harsh and harmful chemicals that are typically found in nail polish. This makes the nail polish vegan-friendly and cruelty-free. It is designed to go on smooth and fully to last a long time. It is also one of the most affordable polishes on our list today. After reviewing these organic nail polish brands, we suggest that you try Zoya first. They provide a menagerie of colors that go on thick and smooth with very little effort. The polish lasts for a long time before it starts to chip, which is typically unusual for organic nail polish. This brand also has the most amount of chemicals eliminated from it. While some on this list have gotten rid of three or even five and seven harsh substances, Zoya has taken a total of 10 out of their products. This makes them the most organic and vegan-friendly on the market. They are also fairly affordable. Others on this list will cost you $, but this highly effective and highly safe brand will only cost you half of that. We think it's quite a steal considering all the many benefits that it offers. Be sure to check out these brands for yourself to ensure that you are keeping your nails beautiful in the healthiest way possible.